Description Afraid of some Pirates? 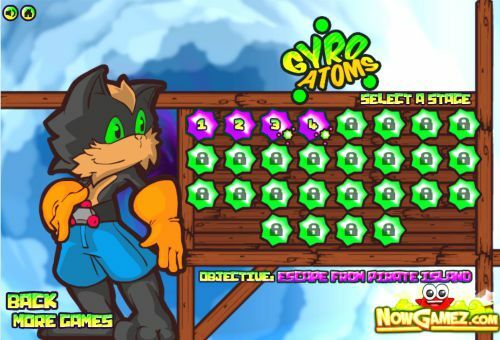 This is a great sidescroller platform game, get ready for again a new adventure of Gyro Atoms, the cowardly Lynx with his giant gloves, jeans and boots. This time you must escape from Pirate Island during your 28 level trip! Jump, climb and fly through the levels and collect all the atoms. Hop on enemies! Every level has his own type of gameplay and difficulty. You will get enough alternation and this game is guaranteed for hours of pleasure. Have fun with again a NowGamez top game. Controls Use arow keys to move. Use spacebar for jump and descent in slowmotion.